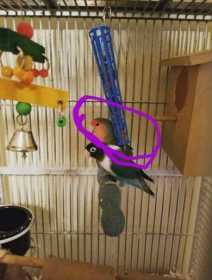 I know this may be a long shot buy my baby Calypso flew away while I cleaned her cage this morning. She is a peached faced love bird. I am offering a reward or I can give you a baby love bird for her safe return. Please, she is one of my special babies. Lost in El Paso Texas (northeast El Paso by Irvin) Please contact me if you have any information. Snap:Stina3ways, IG: mamma_love_bug, email: cvgaray1@yahoo.com PLEASE SHARE!! !